First time I have read about duck breast Prosciutto I didn’t know what to think. Traditional Prosciutto is basically a dry cured ham that has nice layers of fat but duck breast is so lean except the skin, of course. After I made and tasted it, it was clear to me why. 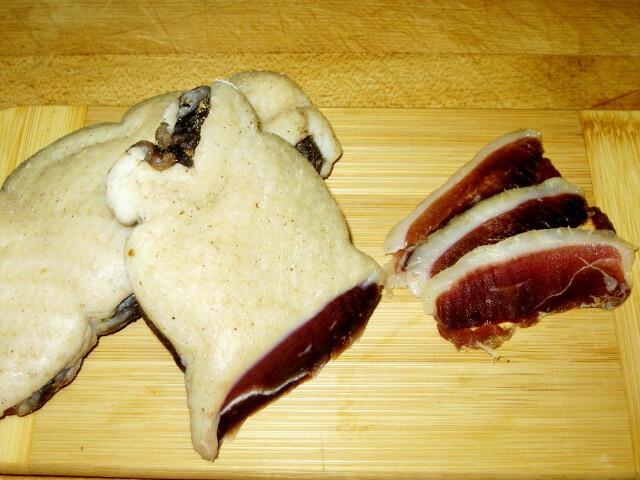 The mix of dry salty meat and creamy fat of the duck skin is so much like the real Prosciutto! I have never seen it in a store, not even in Cheese Boutique in Toronto and they have the best and most expensive gourmet products in Canada. Come to think of it I can understand why it is so rare. 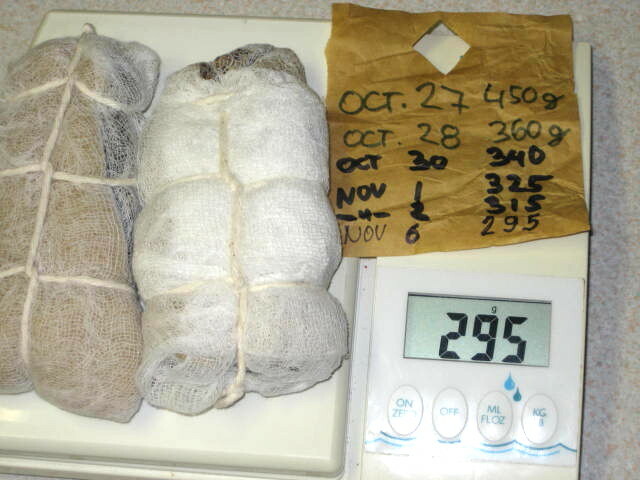 Even though I have carved my own duck into 2 breast halves, 2 legs and bunch of bones for terrific stock those breasts still cost me about $9 and I ended up with 300 g. of finished product. Will I do it again? Probably not. Not because of the labor and cost involved but I do like medium rare breast better. Mind you, this is an excellent recipe, really very good. That got me thinking! 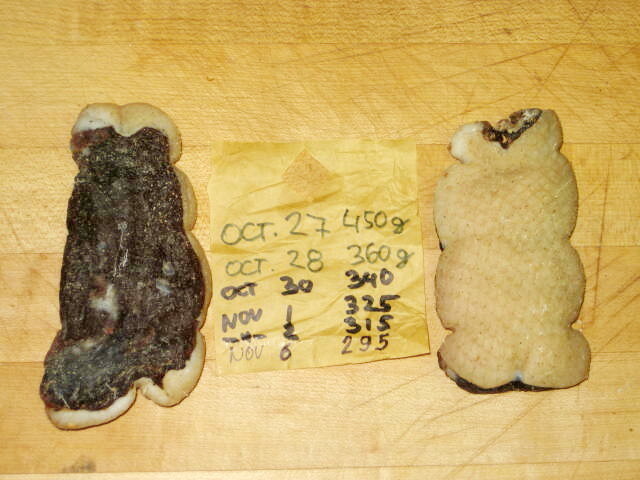 Maybe I should try to make a mini prosciutto, that would be a nice challenge! Recipe for Duck Breast Prosciutto is quite simple but it does take time. I started on October 27th and I felt that it was ready only last week. Fortunately, once the meat is immersed in salt, sugar and spices and then wrapped in air tight package or placed in a container for 3 days all the work is pretty much done. After 3 days it is then wrapped in muslin and hanged out to dry for 3 weeks. Check this recipe, it is very close to what I did. 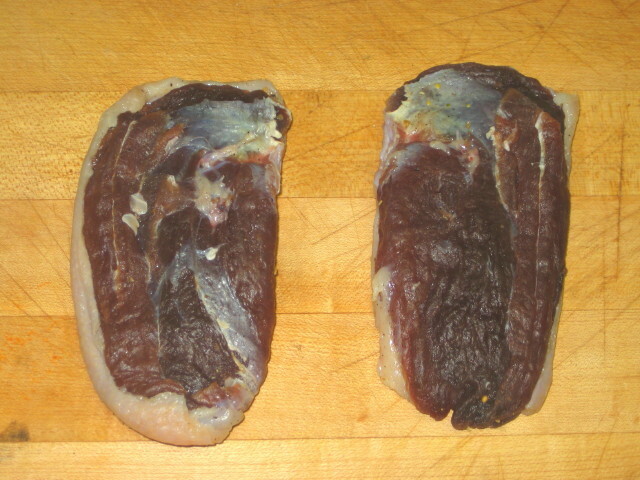 Roughly trimmed breasts before curing. That is a lot of moisture loss but flavor is more concentrated.